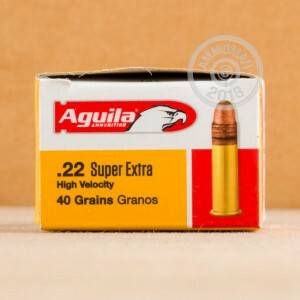 Aguila Ammunition manufactures these High Velocity 22 Long Rifle rounds for precision shooters. 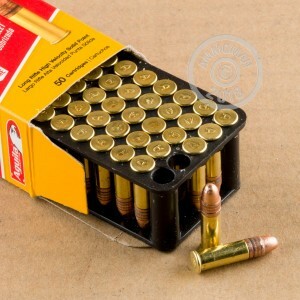 These 22LR rounds are Brass Cased, Eley Rimfire primed and non-corrosive. Each round features a 40 Grain, Copper Plated Round Nose bullet. Compares well with Quality rounds for competition. I used the 22 LR AGUILA SUPER EXTRA in both my Browning Buck Mark and in my Marlin 60 rifle, for target shooting. It shoots clean and without jams in both firearms. I like the copper plating + it shoots very accurate @ 75 yds. zero. HV @ 40 grains. Very good ammo. and the cost is reasonable, when you can find it. Hot load, accurate and not easy to come by.